Japanese children enjoyed Spider-fighting in many years ago. 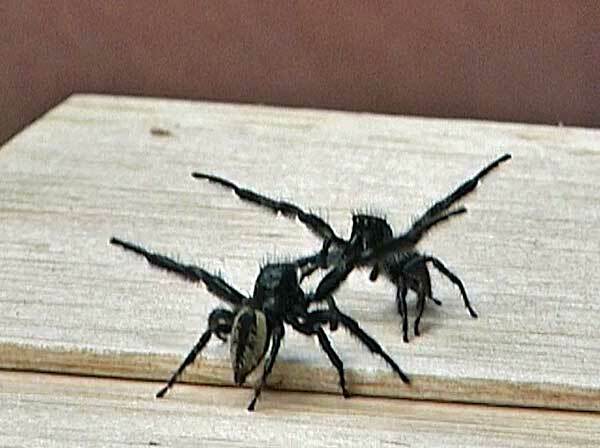 Because two males of jumping spider will readily fight each other, they are known as 'Funchi' and 'Honchi', a regional dialect, in Futtsu City and Yokohama City, respectively. The scientific name of each of the fighting arachnids is Carrhotus xanthogramma (Latreille 1819). The habitat of the species is grasses and low shrubs. 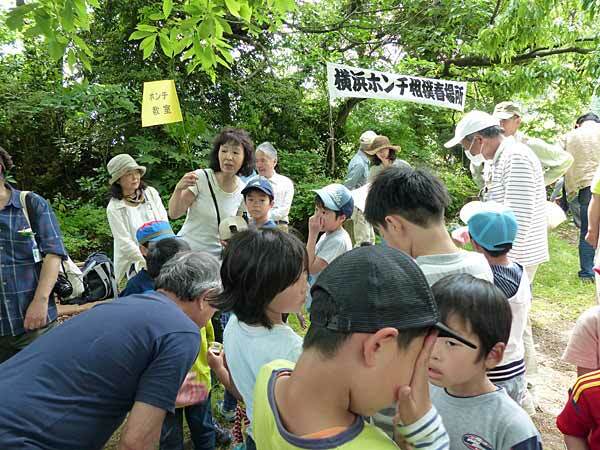 However, destruction of nature took it away from Japanese children. Volunteers are now trying to succeed the tradition of this male-to-male fray and preserving it in Futtsu City and Yokohama City, the Kanto district in Japan. 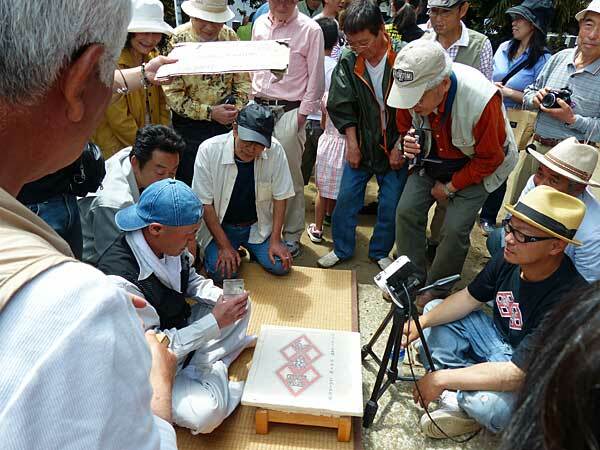 The annual Spider-fighting tournaments in Futtsu and Yokohama are both held in early May. Both children and adults have searched for stronger spiders for the event. We've just had a week long holiday. One day to commemorate the constitution, one for 'greenery', and one for children's day, in other words, our annual 'Golden Week' vacation. Well...OK, so you don't have this kind of May break, but you do have plenty of holidays! We may work long hours, but all the people gathered there are making up for it by enjoying Spider-fighting. The 'Funchi' Spider-fighting in Futtsu City, Chiba Prefecture in 2015. Using a thick piece of cardboard, a man protects spiders, which are in the sumo ring, from the beating sun. 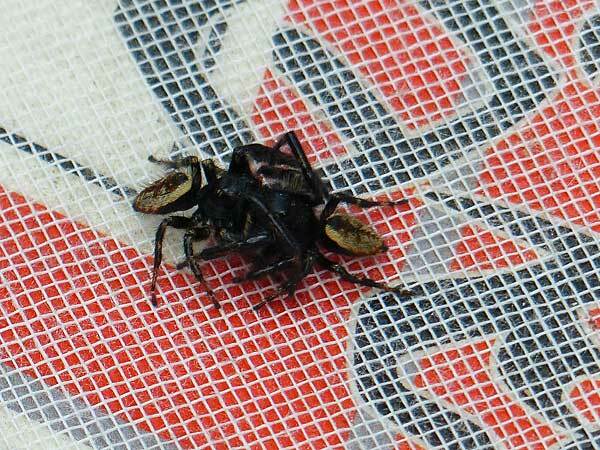 Two males of jumping spider will readily fight each other like sumo wrestlers. Children gather under a flag and enjoying the 'Honchi' Spider-fighting in Yokohama City in 2016. The banner reads "The Yokohama Spring Honchi Sumo Tournament". Male-to-male fray of the 'Honchi', Carrhotus xanthogramma, in Yokohama.